It’s no secret that General Motors is an extraordinarily healthy company that’s making some of the best vehicles on the road today. And with public support for the U.S. auto bailout on the rise, it would seem that many have turned the corner on the idiotic Government Motors nickname for the automaker. Unfortunately, that’s not the case… and we’re not here to curb idiocracy. But what we can do is provide some factual information about the bailout, the current status of GM ownership, and the money repaid after the restructuring. As you can see, individual and institutional investors — the common citizen, mutual funds, investment firms, etc. — make up the biggest piece of the ownership pie, at 44.9 percent. The U.S. Treasury comes in second at 32 percent while the Canadian Government at 9 — both for providing the funds needed to restructure The General. Furthermore, VEBA — the Voluntary Employee Beneficiary Association, created to service GM’s health care liability for UAW-represented retirees, owns 10.2 percent; it’s important to note that this isn’t the UAW itself, but rather an agency working for GM’s UAW member-retirees. Lastly, GM’s U.S. pension plans own 3.9 percent of the automaker. General Motors received two bouts of financial support from two separate presidential administrations during the depths of the recent economic recession: $13.4 billion came from the Bush administration — a decision the former President said he would make again — and $36.1 billion from the Obama administration, making up a total of $49.5 billion. This can be further broken down to $6.7 billion in loans, $2.1 billion in preferred stock, and 912 million units of common stock. 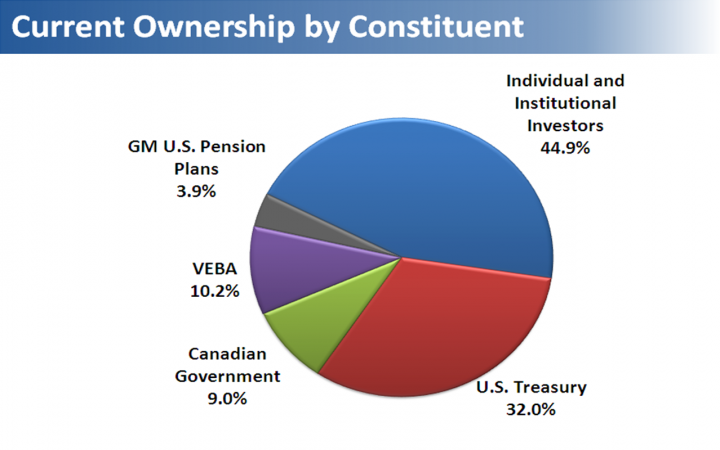 Since the Treasury has an equity stake in GM, it now owns 500 million common shares; this, notably, does not result in any official/legal debt owed by GM to the government, one way or another. What’s more, General Motors does not in any way, shape, or form control when or how the Treasury rids itself of its remaining ownership — and the Treasury does not involve itself with the company’s day-to-day operations. And while many are eagerly anticipating the day that GM is 100% free and clear of any kind of government ownership, the company’s stock should be trading at approximately $50 a share for the Treasury to break even on the bailout; higher than $50 a share, to make a profit (if you believe in interest, that is). At the end of the day, the automotive bailout stabilized the industry and allowed it to regain its footing in a disastrous economic environment while saving an estimated one million jobs across the entire automotive ecosystem. And today, this same industry is earning profits, creating jobs, and making excellent products that are safe, fuel efficient, practical, and — in some cases — inspiring. Anyone have a problem with the facts? So with the price of GM stock at ~$20, taxpayers are $16B underwater and have no reasonable expectation of recouping the remaining $26B. As you pointed out in your article, GM has no obligation to repay the money, just an ordinary fiscal obligation to perform well so that the stock price increases. Sounds Great!! Ths is a very pessimistic viewpoint, not to mention (though I’m sure you are not lacking understanding of the market) a statement that would indicate a lack of understanding of stocks. 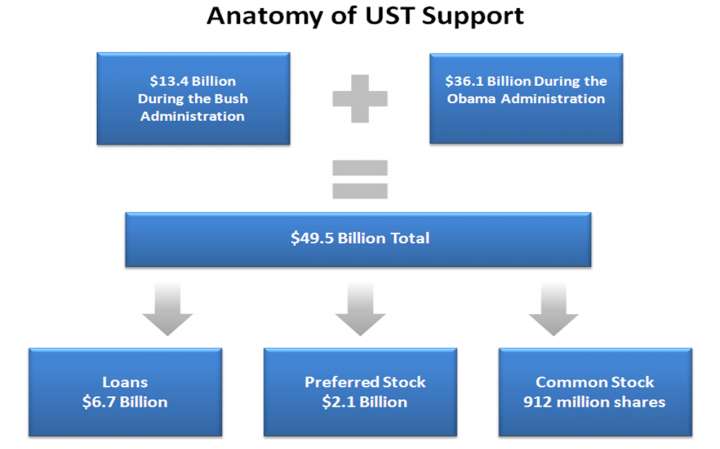 With $23.1 billion repaid as of 3/20/12, and a balance of $26.4 billion owing, on August 24 the actual $21.21 stock price left the Treasury with $10.6 billion in GM stock–still out $15.8 bilion. Today’s close, $24.62 lifts Treasury’s holding to $12.31 billion. Still down $14.1 billion, but hardly “no reasonable expectation”. Analyst opinions ranging around a mean of $31.35, if reached (are you expecting anything worse than a good market when WMR and the Republicans take over government?) the Treasury holding will be $15.7–only $10.7 down. The high expectation of $44 brings the balance down to $4.4 billion. When the GOP gets in an additional 12 million jobs and the economy is popping along like it was the 1990’s, do you seriously expect to see a GM price less than the $52.80 it would take to zero the difference. I’d expect a net profit by the time the Treasury slowly sells it’s GM portfolio. Oh! Ye of little faith! Talk about death by power point. All your numbers completely miss the point WRT the GM bailout. 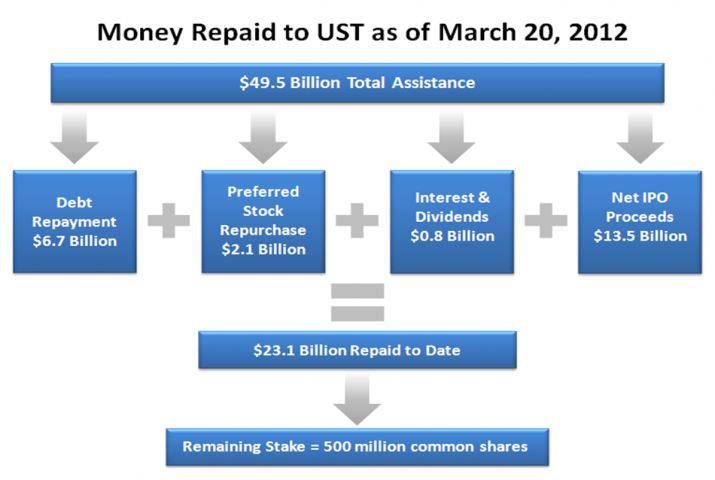 The tax-payer lost money, the bond-holder lost money and the US government had to borrow the money to bail them out. The tactic that the Ordained One used to sink the bond holders is now illegal. They didn’t start over and restructure so this IS going to happen again. We, the taxpayer of the US bailed out a company that emplyed 2/3’s of it’s employees OUTSIDE the US. Oh, and they’ve already slowed production of the Volt because it’s too frakin expensive and cant hold a candle to the Leaf. What part of stupid do you not understand? I for one will not purchase another GM product as long as Uncle Sam owns any share of the company. Volt can’t hold a candle to the Leaf??? What have you been smoking??? what is the current value of the common stock? So with the stock ticker in full swing, you ultimately mean to say, GM’s stock would have to more than double just to get the U.S. out of the hole on this venture. Even then, all we did was save thousands (if not millions) of jobs outside the U.S. Yeah, I can see the since in this decision. For the future, I hope the government would be smart enough to invest in thriving companies rather than failing ones. Is it really wise to buy stock in an almost bankrupt company, and leave the management in charge that bankrupted them in the first place? You seem to have misguided information about the New GM. 3. How is it “almost bankrupt”? My question here is why is govt meddling in private business in the first place. I didn’t think that was govt’s job or mission. I didn’t see them bailing out the small AC Company up the road from me….so why large companies that were so poorly managed and shot sighted in their dealings with the unions that they could never fund the pension and healthcare benefit packages that they promised in the first place. They without a doubt should have been left to go through Chapt 11….end of story. I’m so tired of govt playing a larger and larger part in my life. I’m with “The Truth” and would never buy any GM product in my life. Chapter 11 is a court approved reorganization that allows the organization to keep its assets while paying off its debts. How does the actual reorganization of GM differ in practical terms? Under govt. auspices loans were provided to help GM clear the timely hurdle, and GM has repaid the loans with only common stock outstanding. Think what you will about government stepping in and buying company sommon stock to provide funds that were unavailable in the frozen financial markets at the time, but the alternative was not chapter 11 bur chapter 7; for there was no money in GM’s coffer and the ticker on the stock aws plunging. Bankruptcy would have been a Ch. 11 sale of tangible assets insufficient to satisfy debt and the ultimate demise of the company and unemployment of the workforce, adding another 100,000 laid off directly and at least that much more from suppliers. In what way would that have been better than today’s reality? 1. The government simply provided financing for the bailout. It didn’t do much else. At a time when no other financial avenues were available, it stepped in to save what is still the world’s #1 automaker. So the government took a bold move during an economic crisis. Ford took some money as loans as well… so did Toyota and Honda from the Japanese government. 2. How has the bailout personally hurt you? Or are you simply chasing an ideology? $24.97 a share is GM’s current stock price. This equates a LOSS. The government again places bets on losing propositions. Ford Motor Company did not have this problem and recived NO bailout money. Same economy. The fat cats with the UAW made out like a bandit. Now, GM is sending manufacturing to China along with Chrysler. It won’t be long before the only “American” car company will be Ford. I praise Nissan, Honda and Toyota in having faith in our economy in setting up plants in the United States. Mark my words, GM and Chrysler will be a thing of the past soon and alll those Union folks will be standing in the unemployment line. Well at least GM stock is rising, how is that Ford stock doing. Give the stock 5-6 years (which is not unreasonable for an investment) and the government can get that money back and cut you your check – oh, wait, they won’t do that will they. Go spew your sky is falling crap where the audience isn’t as educated as this one..
@Leroy There’s no “LOSS” just yet, since the government hasn’t officially sold anything. And who is to say what constitutes “too much” when it comes to saving jobs? Mind you, we’re not just talking about manufacturing work here. Also, I think you’re misunderstanding how “the bailout” worked legally: all the government did was provide financing that was otherwise not available. Seems like you underestimate what a healthy and profitable company (like the New GM) is capable of. For starters, they’re making best-in-class vehicles, with the best-selling compact sedan in American (yes, ahead of Toyota, Honda, AND Ford). Suffice to say, your “words” are unfounded. @Alex – The “bailout” wasn’t just providing financing. The “method” they used to conduct the bailout is now illegal! What about the bond holders that got 1 penny on the dollar in return with no say in the matter? Why didn’t they just go through a normal bankruptcy like say the airlines do routinely? This was nothing more than a union payback and a blatant effort to purchase votes in Ohio. Whoa buddy! Let’s not even get into the “legality” of the matter. The laws you are referring to are thinly veiled at best, and only cover a small portion of what transpired in the summer of 2009. Let me ask you this: how much would have the bond holders received if GM went through what you suggest — a “normal bankruptcy like say the airlines do routinely”? Not a penny on the dollar. There stocks wouldn’t have been stripped from them and given to the UAW. This whole thing was underhanded. Glad I wasn’t invested in GM for my retirement. You keep saying things like “This whole thing was underhanded” but never offer up any evidence or proof. The answer to this question “how much would have the bond holders received if GM went through what you suggest — a “normal bankruptcy like say the airlines do routinely”?” is “nill”. Your seemingly deep-rooted hatred of the union doesn’t change the fact that hundreds of thousands of people kept working during the biggest recession this country has faced in the last several decades; companies related to the supply chain continued to operate and their employees were also employed. But forget about all that. A stake of the new GM was NOT given to the UAW. It was given to VEBA. I hope you understand that there’s a significant difference there. ..and I don’t hate unions, I hate that the taxpayers have to bail them out time and time again. Let’s address this one-by-one: this article is a thinly-veiled summary of Obama vs. Romney, leaning towards the latter. It’s pretty much a political summary, not one that takes into account 1) workers (or jobs), 2) the fact that the U.S. maintains a dominant presence in the global automotive industry, or 3) the fact that VEBA has an actual purpose. The main contention presented by the article seems to be that VEBA “made out” some money… do you comprehend the reason for VEBA’s existence in the first place, and why a transfer of funds into VEBA was necessary during the Chapter 11 bk? Ultimately, we can argue for and against the “bailout” all we want. The point is that if it were not for the bailout, GM would have filed for Chapter 7 BK, not Chapter 11. My last GM vehicle was horrible. I took it to several dealers trying to get it fixed under warrantee. It’s “per factory specs sir” is what I got instead. At 60k , it had been in the shop more than driven, complaints to GM were answered, “sorry to inconvenience you”, the motor had been torn down twice, the 3rd air-conditioning unit was going out, I couldn’t take anymore loss, I traded it in on a Nissan and never looked back. To add salt to the wounds, this government took MY tax money to bail them out? I am very bitter because I got robbed, not inconvenienced by GM, and forced to pay to bail their sorry behinds out. Never, ever will they get my business as long as I live. How’s that for an ex-Chevy man.